I was not intending to make a quilt top yesterday afternoon. Quilts were not even on my mind yesterday at all. So I was very surprised that in less than four hours I started and finished a quilt top! From cutting to the final press was four hours! I am LOVING the Moda Love Quilt pattern! Moda is one of my favorite fabric companies! 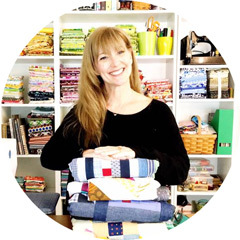 They are a philanthropic company, giving to many very worthwhile causes, FUN, and they are always looking for ways to inspire quilters, of all levels, to sew more by offering free patterns and tutorials! Thank you Moda! I used North Woods by Kate Spain for Moda Fabrics that will be available in JUNE! 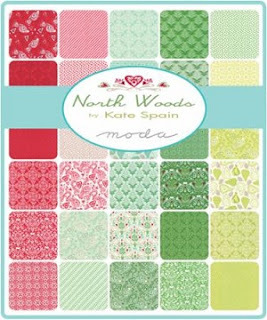 This collection has wonderful colors that include Cranberry, Spruce and Linen. It is a very lovely collection and mane of the fabrics are not just for Christmas! Very versatile. I made the Charm friendly version. I had a little more than charm size for the fabrics. It was a breeze to cut them to the correct size and easily sew this top together. This would be a great beginner pattern, a fabulous charity baby quilt or a lovely last minute baby gift! I used Aurifil 50wt for perfect piecing and this was sewn on my Bernina 440. Next up for this pattern is another new quilt from my grand baby girl due in July! Baby quilts are the best! Oh thank you so much for bringing this lovely to my/our attention!!! I really have some nice pieces for this one!!!!! liking this pattern for a baby quilt, have some charm pack maybe I should do something with mine too. I love quick finishes like this! Beautiful! How exciting to sew for your very own grand baby!! Can't wait to see it! Just what I need this week! I need a baby quilt by end of June and have put it off to long to do anything very elaborate. This one offers great style with reasonable amount of piecing. Thanks for pointing us too it and showing us such a sweet version. Thank you for the great idea! I was needing something to play with today and I have lots of extra Candys to choose from! This is a great pattern! SO quick and fun to put together in any of the sizes Moda offers. :D Looks fab! Love your version! Such a fun quilt to make.